Clarins is a brand I haven't really dabbled with a lot. I tend to stick to drugstore skin care as I find it to be a lot more cost effective and I have used some really great things from the high street that work well. 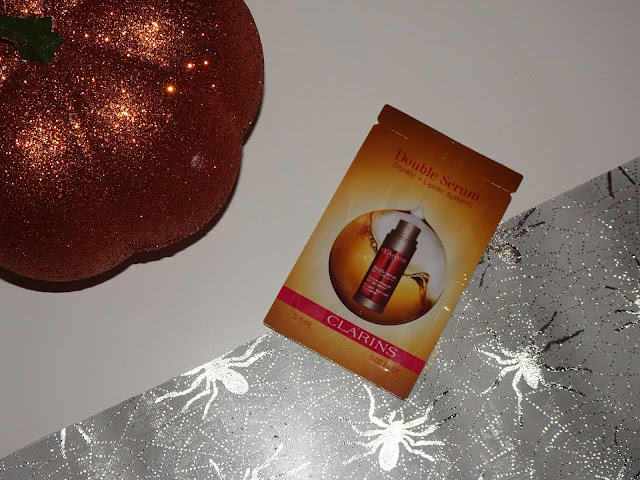 I had a couple of sachets of the Clarins double serum and wanted to test it out over a few days to see if I thought it was something I would want to purchase when I run out of my usual serum, or if it would be something I want to use at a later date. The sachet is the typical foil one that works well to hold enough product for one or two uses. The usual bottle however is a sleek brown toned bottle with a pump lid that I really like the look of and think would be easy to use and sit nicely on your bathroom counter or where ever you store your skin care. The product itself is a nice rich serum that is really easy to work with and work into the skin without it being too heavy or overpowering. I like that the formula isn't too thick or oily as I find these can make my skin feel a little clogged. I found the product worked together in my hands thoroughly and made it easier to apply all over my face and neck giving even and full coverage over the skin. Once on my face my skin felt soft and smooth. It did take about 20 minutes to sink in fully but I think this can vary depending on how dry or dehydrated the skin is when you use this. I applied my moisturiser over the top and simply went to bed and read for a little while before going to sleep and it was soaked into the skin enough by that point for me to lay down and feel comfortable resting on my pillow. Overall, after using this for almost a week my skin has felt very soft and has looked quite radiant and glowy. I feel like this serum is a really nice one to hydrate and boost the skin. It is claimed to be their 'most powerful complete age control concentrate' meaning it is anti ageing, from using this for a short time I cannot comment effectively on how good this is at fighting signs of ageing, but on the short term this is definitely a really nice serum that I would think to use again. The serum itself is £57 for 30ml on Boots here, and while I really do enjoy it, this is a product that I have other things similar to for now so I don;t need, and to be quite honest, is a little out of the price range I would want to pay for my skin care. If you have been eyeing it, I do think it is lovely and if it wasn't out of my budget I definitely would pick it up in the future, it just isn't something I can justify right now!